For the Australian aboriginals, the world is just the corporal materialization of the spirits of the ancestors. And they refer to is as Jukurrpa, word that means “dreaming”. The traditional painting of these tribes is passed through generations using local pigments to decorate from murals to musical instruments like the didgeridoo. 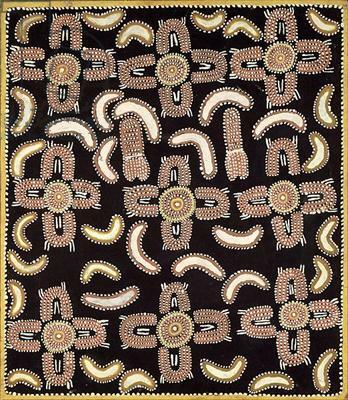 But from the beginning of the 70s, the aboriginals started to use acrylic paintings, allowing them to create works with better quality that can last for a long time. Boy’s story is a common motif among the original inhabitants of Australia. The boy is represented with the white “Us” scattered through the painting, while the four “Us” that surround the circles represent women sitting in a bonfire, as a social meeting. I think this canvas portraits an everyday life scene of the tribe. While men go out hunting to provide their families, in the village are left the women that chat with each other; and the children that, restless, swarm around them. ~ by Álvaro Mazzino on September 29, 2010. If they opt to use Qualcomm in the Galaxy S7, they may be waiting for the upcoming Snapdragon 820, which is expected to be launched at the beginning of the next year. Jong-Kyun Shin, President of Samsung, spoke out about the processors. This really is fitting though since the “Fab 5” put Nike on the map — if it wasn’t already on everyone’s radar. The only question left is whether or not Chris Webber will get a pair. The first proper championship sneaker release for Kevin Durant is here, with his Nike KD 10 “Celebration” pair arriving on Tuesday morning. The sneakers come in colors matching Durant’s Golden State Warriors jersey and reference his Finals MVP award along the heel. This entry was posted on September 29, 2010 at 10:12 and is filed under Abstract.You can follow any responses to this entry through the RSS 2.0 feed.You can leave a response, or trackback from your own site.